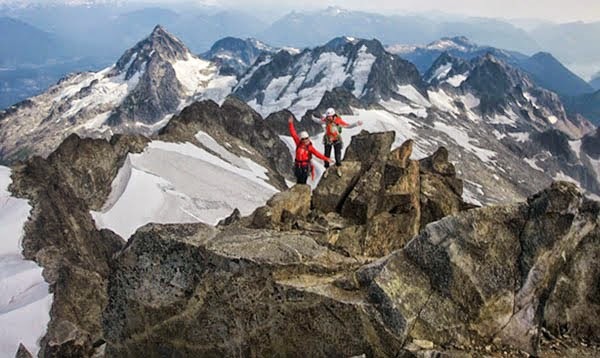 Ross Berg and client climb in the Tantalus Range. Photo by Ross Berg. Holly, Bonnie and Ashley traverse the Dione Glacier. Photo by Bram Whillock. On Saturday morning I met up with Bram Whillock, Ashley Green and Bonnie McIntyre (all rad climbers from Squamish) at the heli port. 'Was I in over my head? ', I questioned in the back of my mind. 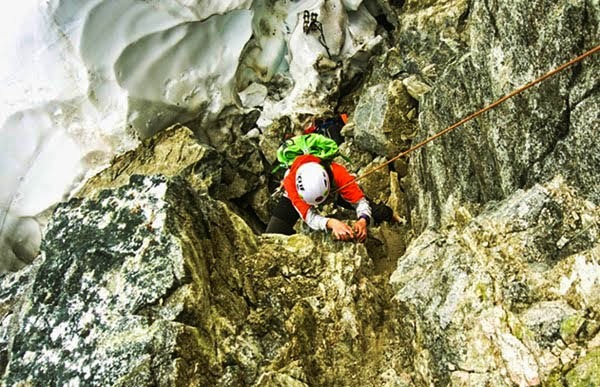 Bram consoled me when he explained that the other women's strength was in the rock and I would balance the team with my strength in the snow and crevasses… We were heading alpine climbing and it was going to be a mixed bag. Ross Berg, IFMGA mountain guide from Altus Mountain Guides, and his client, Seth Griffith from Seattle, arrived and we loaded the heli. 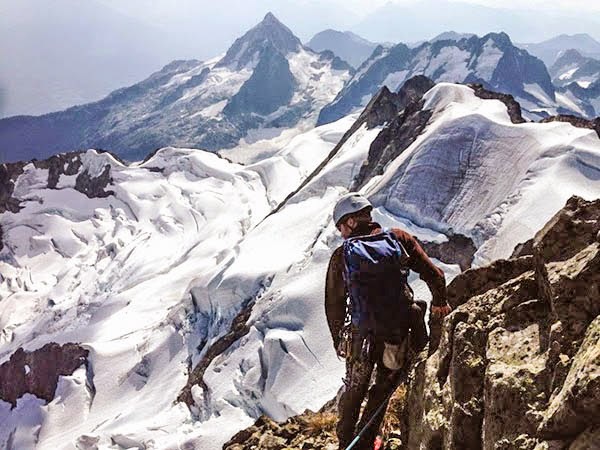 We were flying to the Jim Haberl Hut on the Serratus-Dione Col. Ross likes to call it his 'Weekend Cottage' as he managed multiple trips this summer to climb with his clients on several peaks despite 'the roll of the dice' weather. The Tantalus Range sits next to the Howe Sound and is a short distance from the Pacific Ocean, bringing in variable weather rather quickly. Maximiliano transitioning to ski in late April 2011. Photo by Holly Walker. As we flew past Omega Mountain, Lake Lovely Water and towards Alpha Mountain, I had flashbacks. I had received a similar text message from Maximiliano Artoni, a ski guide from Argentina, in late April of 2011. He had invited me on my first ski mountaineering trip with big objectives and I also was the last seat in the heli… For three days, as I grew accustomed to my first pair of Dynafit bindings, we skied massive peaks from the Haberl Hut and fought intense clouds that rolled in every afternoon. Max and I summited and skied Serratus and ended the trip with glacier navigation and ascending a steep couloir on Alpha. 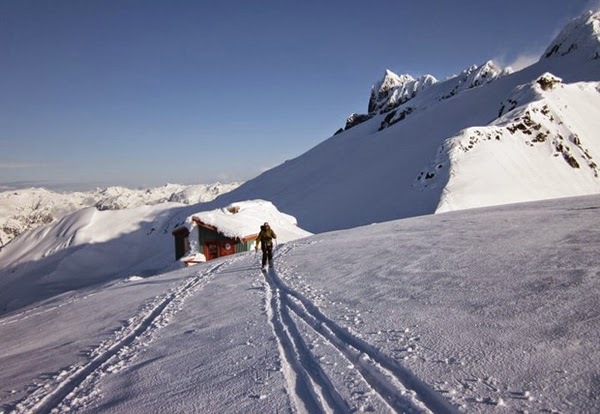 We skied down it, airing the bergshrund and finishing at Lake Lovely Water, where we awaited our heli pick-up to exit from the Tantalus Range. 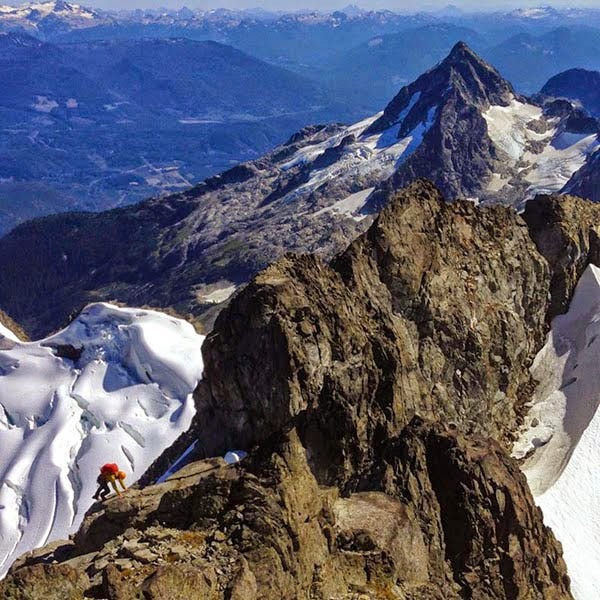 Maximiliano Artoni ski tours from the Jim Haberl Hut of the Serratus-Dione Col. Photo by Holly Walker. The daydream ended abruptly as the heli landed next to the Haberl Hut. Ross, Seth and I unloaded our backpacks and climbing kit. We then entered the hut to organize our packs, leaving our overnight gear at the hut. Bram, Ashley and Bonnie arrived in the next heli load and we decided that Tantalus Mountain was too long of an objective with the late start of 10 a.m. Instead we opted for Dione, the next peak over, and we would be familiar with the approach if we chose to attempt Tantalus the following day. We roped up on to the Dione Glacier, hiking quickly on snow until we reached an icy section with open crevasses. Ross had warned us that the typical snowpack had melted out more than he had ever seen (maybe 20-30cm less), exposing glacier ice. After navigating and finding a snow bridge, we crossed and continued up to the Southwest side of Dione to climb rock. We made a short transition on the Rumbling Glacier and then climbed the Southeast Face of Dione to the summit. Bram signed our party in to the log book. After some goofy pictures, we began the descent back to the Haberl Hut. Bonnie and Holly on the summit of Dione. Photo by Bram Whillock. Bram, Ashley, Bonnie and Holly crossing the Rumbling Glacier. Photo by Ross Berg. 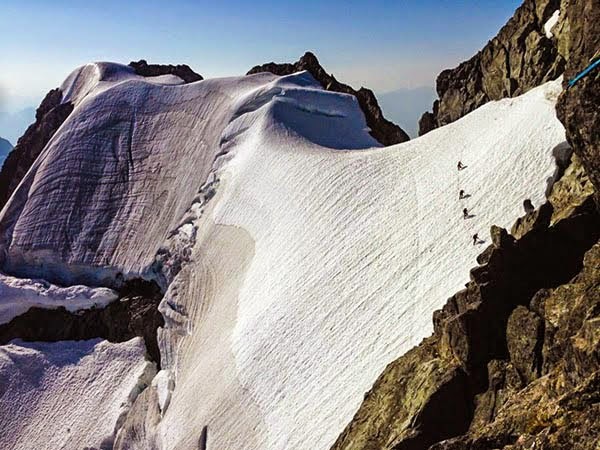 Sunday morning came quickly and my watch buzzed at 4 a.m. With an alpine start, we were climbing up the glacier by 4:45 a.m. in the dark via headlamp, approximately 15 minutes behind Ross and Seth. 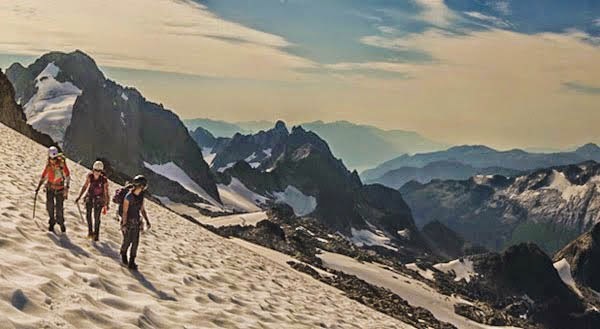 We repeated Saturday's climb onto the Rumbling Glacier, this time over to the Southeast Spur of Tantalus. 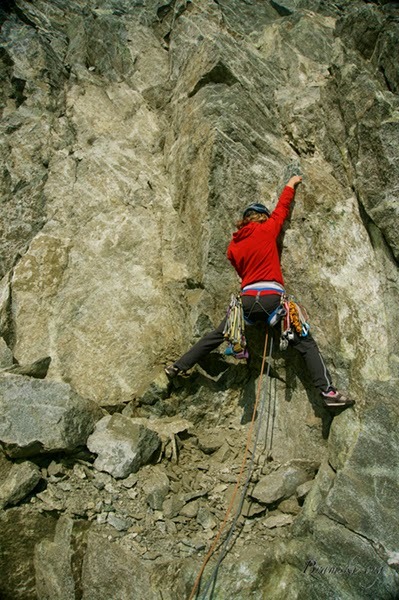 After crossing the moat from snow to rock, Ashley led the climb placing trad gear. With a party of four climbing on the same rope and with numerous traverses, our pace was slow. Only a short distance beyond the Witch's Tooth, Ross and Seth passed us on their descent from the summit. Ross reported that a thunderstorm was now predicted for that afternoon and he would be calling for the heli to pick us up early. Our team regrouped and the decision was made to bail on our summit attempt. Quick down climbing and rappelling ensued. I now understood Ross's 'roll of the dice' theory. I continue to see the Tantalus Range regularly while driving along Highway 99 between Squamish and Whistler, and luckily, I know the mountains aren't going anywhere. Holly begins to climb the Southeast Spur of Tantalus. Seth works his way up the Southeast Spur reaching the summit of Tantalus. Photo by Ross Berg. Skier and writer Holly Walker lives in Whistler when she is not traveling in search of perfect pow. 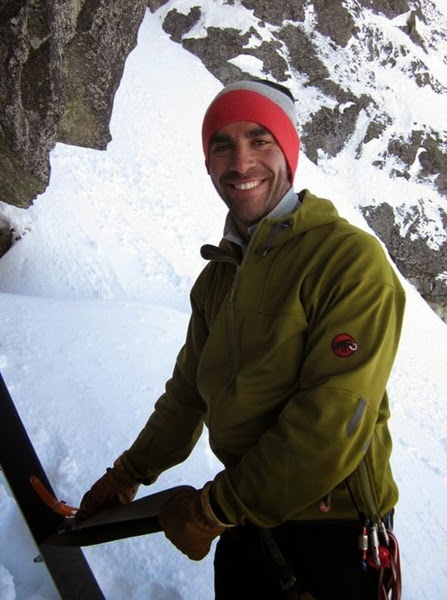 Sponsors include Mammut, Clif Bar, K2, Smith, POW and Mons Royale.